SURIGAO CITY (MindaNews / 11 Dec) – Communist rebels here launched a series of strikes in this city Sunday. According to Supt. 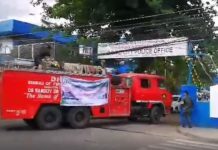 Jay Baybayan, chief of police of Surigao City, alleged New People’s Army (NPA) rebels ambushed a police patrol car of the municipality of Claver in Surigao del Norte Sunday morning. The said police vehicle was traveling from Claver town to this city to undergo repair and maintenance. When they arrived at Kilometer 13 in Barangay Anomar here, heavily armed men opened fired at the vehicle. Luckily, all the passengers were unscathed from the ambush. 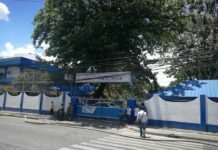 This incident was followed by another attack by suspected NPAs that occurred in Kilometer 12 in Barangay Trinidad in this city on the same day. A team from the Surigao del Norte Provincial Mobile Force Company (PMFC) led by Insp. Rodulfo Haradji was ambushed by an undetermined number of heavily armed rebels. The team was able to retaliate in the firefight that lasted 10 minutes, police said. The rebels quickly left when another team from PMFC and troops from the Army’s 30th Infantry Battalion arrived to provide reinforcement, reports said. No one from the police side was reportedly hurt during the said strike. Senior Supt. Antony Maghari, police provincial office chief, condemned the deliberate and premeditated series of attacks against his men. Ka Oto, spokesperson of the Guerilla Front 16 of the NPA operating in Surigao del Norte, has not confirmed yet that they were responsible for the series of attacks on Sunday.